Whenever things collide, it gets interesting. Especially in space. A majority of the stars in our universe do not just live a happy life alone, but they are part of gravitationally bound systems of two or sometimes more stars. So they live a happy life together. However, some day, one of the two partners will have to pass away. The death of a star is often not a peaceful process, but very violent. Depending on the mass of the star that is about to end its life, this could mean that e.g. a supernova explosion takes place, leaving behind an expanding shock wave of stellar material and a very compact object. Either stellar-mass black holes or neutron stars are compact objects. A neutron star is "compact" because its mass is roughly that of our sun, which is roughly 1 million times heavier than our host planet, but the diameter of this neutron star is only 30 km, comparable to the size of a big city. So, yes, you have not seen anything like this here on Earth. As indicated in the sketch by Khangulyan et al. below, the gamma-ray binary system PSR B1259-63/LS 2883 consists of a host star (LS 2883) and a neutron star (PSR B1259-63). You will notice several features in this sketch. Probably most importantly, there's a cone-like structure around the pulsar pointing away from the host star. This structure is created by the ram pressure of the slow but dense stellar wind emitted by the host star. The electron-positron wind created by the neutron star is faster by a factor of roughly 100 (energies of the particles in the wind reach up to O(10 GeV)), but the density of this wind is much lower. Hence the fast wind is pushed away from the host star by the slow wind; think of it as "truck versus race car". Another apparent feature of this system is the relatively dense disk around the host star. The neutron star is believed to cross this disk twice each orbit, and whenever it does, it's relativistic particle wind is thought to be confined in the dense, gaseous disk material. In between the disk crossings, the pulsar passes the point of closest separation from the host star, called periastron. After the neutron star has crossed the disk a second time, it moves away from the host star, escaping the virtue of the stellar wind. After 3.4 years, the neutron star will return to repeat another cycle of interactions. The H.E.S.S. telescopes in Namibia have observed this remarkable object at very-high energies (VHE; photon energy ≳ 100 GeV) every time the neutron star moved close to the star since 2004 [2-4]. In-depth studies of the evolution of the flux level (the light curve) above photon energies of several hundreds of GeV have been performed. Also the distribution of the observed flux as a function of the gamma-ray energy (the spectrum) has been studied. Since the H.E.S.S. 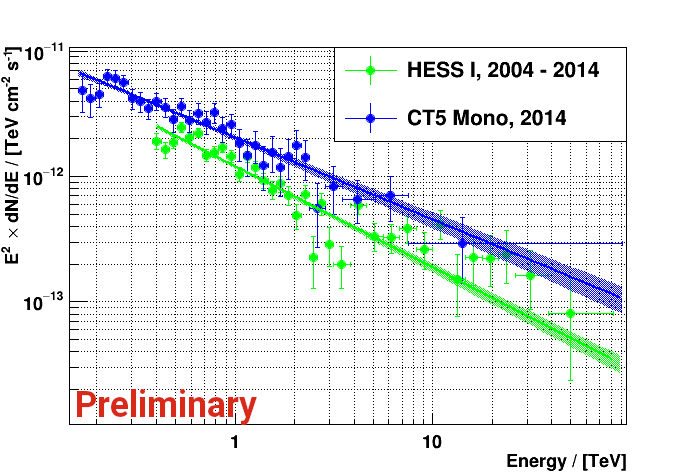 array was upgraded in 2012 by adding the largest Cherenkov telescope on Earth (CT5) to the existing telescopes, the observations in 2014 and 2017 were different from the ones conducted with the H.E.S.S.-I array in the previous years. In addition, the 2010/11 periastron passage was observed by the Fermi-LAT satellite experiment, which detected a spectacular increase of the flux at high-energy gamma rays by an order of magnitude . This was not predicted by any model of the system so far. Not knowing if this flare would reoccur in 2014, it was made sure to observe this source at the relevant part of the orbit with the H.E.S.S. telescopes, in parallel to observations with the Fermi-LAT. The high-energy flare did reoccur, but how about VHE gamma rays? The most complete view of the light curve at VHEs is obtained when combining all available data, from 2004 up to 2017. The above graph shows the evolution of the VHE gamma-ray flux above photon energies of 400 GeV as a function of time. Data points represent significant fluxes, arrows indicate upper limits on the flux. Each bin represents up to 7 days worth of data. Three flux maxima can be identified: before the first disk crossing (indicated by the first dotted line, before periastron), after the first disk crossing and after the second disk crossing (second dotted line). The prominent maximum before the first disk crossing is a new and unexpected result. 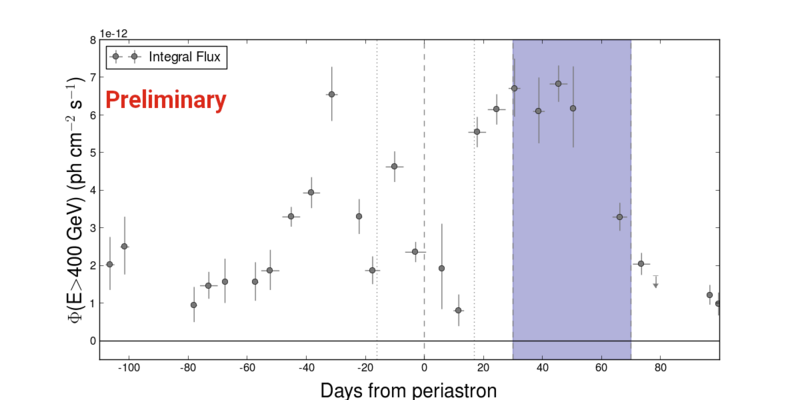 Furthermore, the high flux observed just after the second disk crossing remains approximately constant until ~50 days after periastron, which is also a new insight. This is deep in the time domain in which the Fermi-LAT experiment has detected the HE gamma-ray flare in 2014, the time span of which is indicated by the blue band. At VHE gamma-ray energies, a flux increase by 30% or more can be excluded at the 95% confidence level. Hence it can be concluded that the VHE gamma-ray properties are not just a simple extrapolation of the properties observed in the HE gamma-ray domain, but distinct processes must be at work in the two energy domains. The two spectral energy distributions (SEDs) of PSR B1259-63 shown below suggest two major insights. The first is that the SED reconstructed from data taken with the large CT5 telescope follows a power law down to 178 GeV, an unprecedentedly low energy! The second insight is that, when combining all H.E.S.S.-I data, the SED extends to at least 50 TeV without a sign of a down-turn. You might notice that the two SEDs shown here do not overlap. This is actually the expected result, since the observations in 2014 sampled parts of the orbit at which relatively high fluxes are observed, while the long-term average spectrum includes lower-flux episodes as well. The photon indices instead are compatible with each other within uncertainties: 2.81&pm;0.04stat&pm;0.20sys in case of the all-year spectrum versus 2.65&pm;0.05stat&pm;0.20sys in case of the CT5 mono spectrum, respectively. 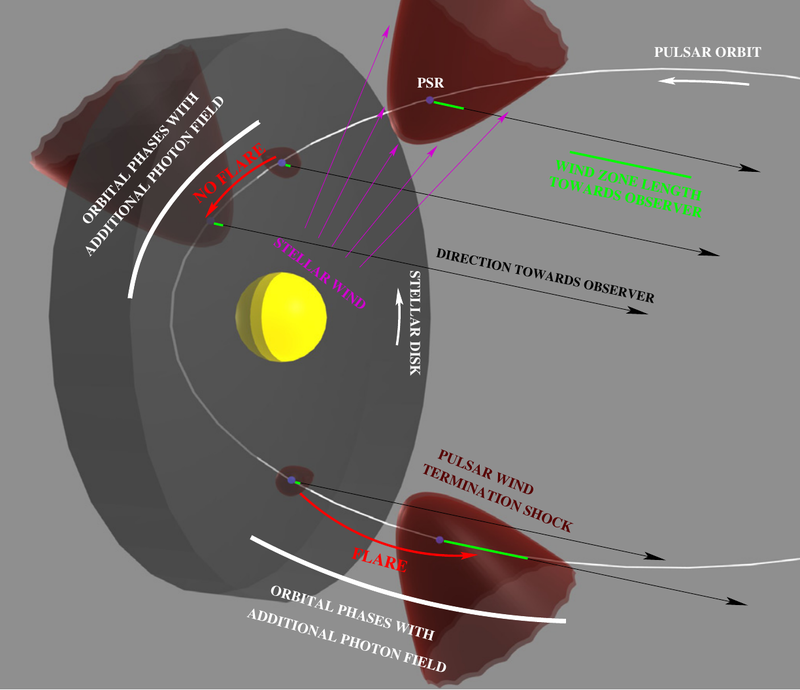 In fact, an analysis of the stability of the photon index across different parts of the orbit has been performed. It is found that the index is compatible with a constant within two standard deviations. What can we learn from these observations? First of all, on a general level, neither the particles in the wind of the host star nor particles in the wind emitted by the neutron star reach the energies the gamma-ray photons have that we observe. In fact, these gamma rays are roughly 1000 times more energetic than these wind particles! This is made possible by the "collision" of the two winds, a process in which a shock front is formed. In reality, it's not the wind particles that collide, but the charged and magnetised winds as particle ensembles. As explained in the theory of shock acceleration, charged particles like electrons or positrons ("leptons") or protons can be accelerated in shock fronts. Once accelerated, they can create very-high energy gamma rays we observe through interactions with the surrounding gas and photon fields. An ever-reoccurring question concerns the dominant type of particles that are accelerated at the shock. In case of PSR B1259-63, the fact that flux levels measured by H.E.S.S. are high enough to be detected months before and after periastron favours theories employing electrons and positrons. For protons the observations are hard to explain, since the density of the stellar wind, which is the main source of protons in this object, is too low to provide the observed gamma-ray fluxes. The detection of gamma rays up to tens of TeV and the lack of a down-turn of the spectrum will challenge existing models of this system. Also the detailed, finely binned light curve provides a rich data set on which theories and models can be built. Since the relatively pure and well-constrained environment that the neutron star experiences over the course of one orbit is changing constantly, this system is a unique laboratory to study emission, acceleration and scattering processes. Yet there are some major unknowns, for example the exact orientation of the binary system with respect to our line of sight is still under debate. This has great influence on the interpretation of the measurements. Future observations across the different energy bands will help to clarify such questions, paving the ground for a much more complete theoretical understanding of gamma-ray binary systems.